Hammurabi (Akkadian from Amorite ˤAmmurāpi, "the kinsman is a healer," from ˤAmmu, "paternal kinsman," and Rāpi, "healer"; ca. 1810 BC?–1750 BC) also rarely transliterated Ammurapi, Hammurapi, or Khammurabi) was the sixth king of Babylon. Hammurabi is credited with achieving the conquest of Sumer and Akkad,and ending Amorite rule of Isin. He was the first king of the Babylonian Empire, giving Babylon hegemony over Mesopotamia. As with any dates from the early 2nd millennium BC, the dates of Hammurabi's life are highly uncertain and subject to wide disagreement among various sources, However, according to the middle chronology, Hammurabi was born around 1810 BC and reigned over the Babylonian Empire from 1792 BC until his death in 1750 BC (corresponding to 1728-1686 BC short chronology). The first few decades of his reign were relatively peaceful. In the 30th year of his reign, Hammurabi crushed an invading army consisting of Elamite and other forces in a decisive battle, and drove them out of Babylonia. The next two years were occupied in adding Larsa and Yamutbal to his dominion, and he formed Babylonia into a single monarchy centred on Babylon. A great literary revival followed the recovery of Babylonian independence, and the rule of Babylon was obeyed as far as the shores of the Mediterranean Sea. Vast numbers of contract tablets, dated in the reigns of Hammurabi and his successors, have been discovered, as well as their autographed letters. Among them is one ordering the dispatch of 240 soldiers from Assyria and Situllum, evidence that Assyria was at the time a Babylonian dependency. Hammurabi expanded the rule of Babylon by first conquering cities towards the south, before his conquest expanded to cover most parts of Mesopotamia. His military conquests came late in his reign, perhaps brought on by the fall of the empire of Shamshi-Adad I. Hammurabi is also credited with improving irrigation in Babylon. Hammurabi is perhaps best known for his promulgation of the new code of Babylonian law–the Code of Hammurabi. This was written on a stela and placed in a public place, so that all could see it, although it is thought that few were literate. This stela was removed as plunder to the Elamite capital Susa, where it was rediscovered in 1901 and now stands in the Louvre Museum. While the penalties of his laws may seem cruel to modern readers, the fact that he not only put into writing the laws of his kingdom, but attempted to make them a systematic whole, is considered an important step forward in the evolution of civilization. The code is also one of the earliest examples of the idea of presumption of innocence. Following Hammurabi's successors, the Babylonian Empire collapsed due to military pressure from the Hittites, led by their king Mursili I. However it was the Kassites, led by their king Agumkakrine, who eventually ruled Babylon. Although there were many rebellious cities, the Kassites ruled for 400 years, and respected the Code of Hammurabi. Bas-relief of Hammurabi in the U.S. House of Representatives chamber. Because of the legacy of Hammurabi as a lawgiver, Hammurabi is depicted in several U.S. government buildings. Hammurabi in one of the 23 lawgivers depicted in marble bas-reliefs in the  An image of Hammurabi receiving the Code of Hammurabi from the Babylonian sun god (probably Shamash) is depicted on the frieze on the south wall of the U.S. Supreme Court building. 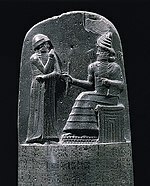 Hammurabi also lent his name to one of the very first computer games, Hamurabi.